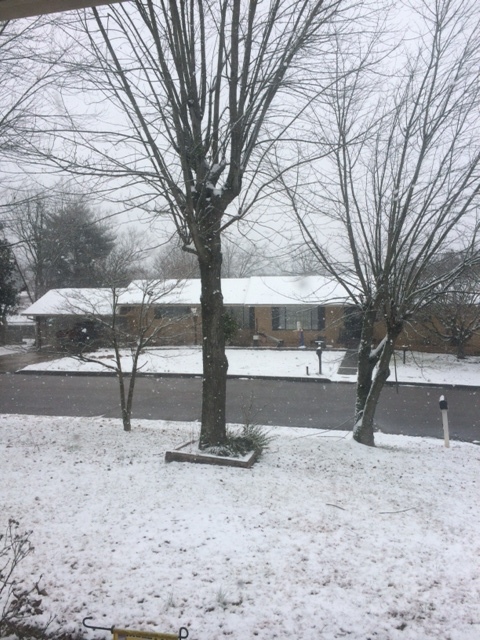 We don’t often get snow here in Chattanooga, but when we do, it shuts the whole city down for days. I think I read that we have eight snow trucks for the whole city. It’s ridiculous! There are all sorts of false reports by the meteorologists, but then we got hit pretty hard two weeks ago. All we got was an inch of snow, but it’s the ice underneath the snow that’s so dangerous. I couldn’t get up my driveway to park my car. I had to park on the street and pray no one would slide into me. They’ve been calling for snow this week and today we finally got it. It fell hard, but it wasn’t cold enough to stick to the roads, so while it’s nice and white and pretty, we’re not snowed in this time, which is good. I’ve been frustrated with the weather because I’m trying to get crews in to the new house to do all of this work before we move next Friday (weather permitting), but it’s too cold to caulk, to paint, to work with mortar, to do stuff on the roof (the shingles will break), to do just about anything. And the house is on top of a mountain, so even getting up there is a real problem. I’ve had to reschedule my garage door opener installer three times. Now they’re scheduled to come on Friday and I hope it will work out. Time is running out. My wife’s working from home today and was just bitching about the weather — about how she could have gone into the office and how the storm was just a fraud. LOL! I like working from home. Of course, I/we have been doing a lot of packing and we’ve made a lot of progress. I think we’ll be done with most everything by the weekend, except for the hanging clothes and some other assorted items. The packers are bringing wardrobe boxes on moving day, so we’ll have to pack those then. I’m going to pack up my computers the night before and I guess we’ll take the cats to my mothers’ the morning of and pick them up when it’s done. I guess. They’ll be traumatized, of course. Toby is already acting depressed, possibly because of all the packing and strange people who keep coming here. We don’t really know. I’m going to leave you with one picture from this morning. Enjoy. This entry was posted on February 12, 2014 at 2:39 pm	and is filed under Uncategorized. Tagged: moving, snow, weather. You can follow any responses to this entry through the RSS 2.0 feed. You can leave a response, or trackback from your own site. I wish you well with the move. I hate to even say the “m” word because in my 26 years of marriage to my current husband we have moved over a dozen times! I can’t imagine doing it in the midst of freezing slush. Your cat is depressed because you are upsetting his “nest’. They get real skittish when things are different. Have you ever moved with him before? Great blog by the way! This is my 28th move. Toby has moved with me before, but he hasn’t done well. Henry does just fine. Weird. Toby must be a Cancer. We don’t adapt well to change. haha.